This week’s featured photograph from Creative Sparks comes from Bob Webster. Normally Bob is trekking through the U.K. and other locations around the world making beautiful photographs of flowers, gardens and rustic country landscapes. 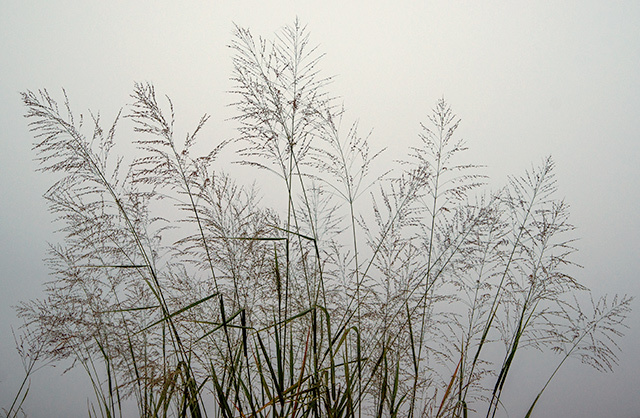 This week Bob took advantage of an unusually foggy day at home in Vero Beach by exploring the native plants in the undeveloped areas around his home. I really enjoy the contrast between complexity and simplicity in this photograph. The image is quiet yet full of movement and energy. The limited color palette adds to the stillness of the image while the strong lines of the angled grass at the bottom and more delicate lines throughout the middle contribute to the complexity. Meditative and energizing. Nice work Bob!